What's the difference between Departments and Locations? Departments are designed to group employees by work type. Some examples are demolition crews, drywallers or service technicians. Locations can be used to group employees from different offices or who service different areas. For example, if you have one office on the east side of town and another on the west side, Locations allow you to create groups for the employees in each one. There really isn't a right or wrong way to use Departments or Locations. Whatever way makes sense to make groups of your employees is valid. Using the two in combination can pretty powerful as well. You can run reports or create schedules for the service technicians from you west side office or for the framing crew from your east side office all at the same time. You can also add employees to more than one Department or Locations, so feel free to organize your employee groups anyway that helps you manage your business. You can create and manage your Departments and Locations from the Admin menu. Managing Locations works exactly the same way as managing Departments, so while the following instructions are for Departments, know that it will be the same steps and options for Locations. From the Departments (or Locations) page, you can add new Departments by clicking on the green "Add Department" button, or edit existing Departments using the blue edit button. You can also delete a Department if you don't need it anymore, but don't worry, no employee or time records will be deleted if you do. Using the add or update Department form, you can set the name of the Department and which employees belong to the group. Where can I use Departments and Locations? You can use the Department and Location employee groups to filter reports, view timesheets, schedule work and to set manager permissions. 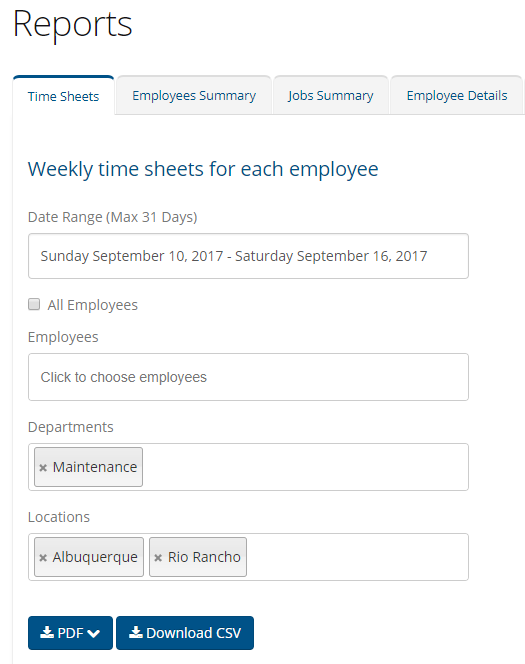 On the Time Sheets page of your administrative website, you can use Departments and Locations to show only the employees in those groups on the screen. Just select the Departments and Locations you want and hit the blue "filter" button to update the view to only what you want to see. If you have ever wanted to schedule more than one employee at once, you're going to love this. 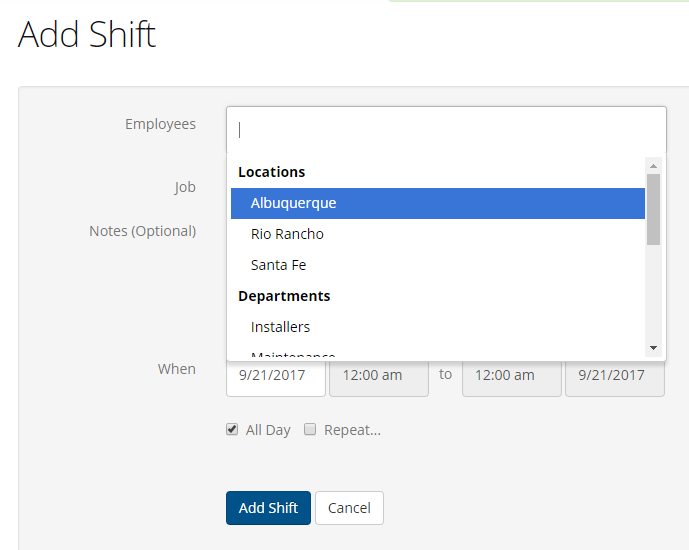 When you add a shift, you can select an entire Department or Location to that shift rather than adding each employee individually. On the Schedule page of you administration website, click on the Add Shift button to get started. 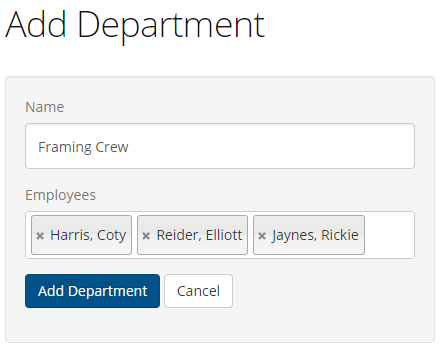 When you click into the "Employees" field, a drop-down will appear with all of your Department, Locations, and Employees. Select which group or individuals you want to add to this shift and your all set. When you finish adding all the details about the shift (e.g. start time, end time, job and notes) and click the blue Add Shift button, this shift will appear on the schedules of all the employee in the Department and Locations you selected. You can now schedule entire crews at once. That will save you some time. All of the reports in ClockShark can be filtered to only include the Employees, Departments, and Locations you select. 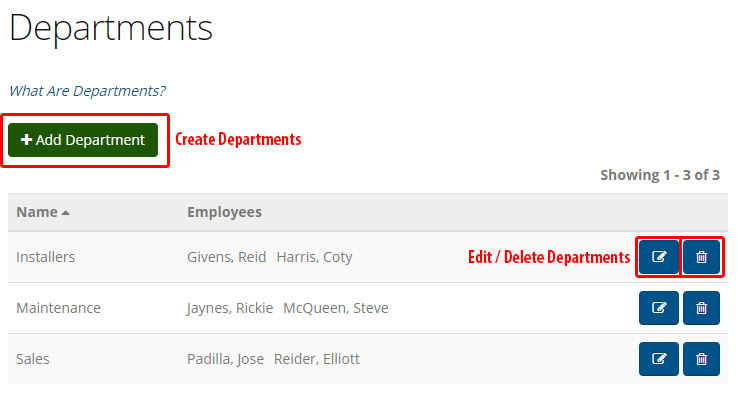 Remeber to uncheck the "All Employees" checkbox to make the employee filters active. Departments and Locations make assigning manager permissions a breeze. 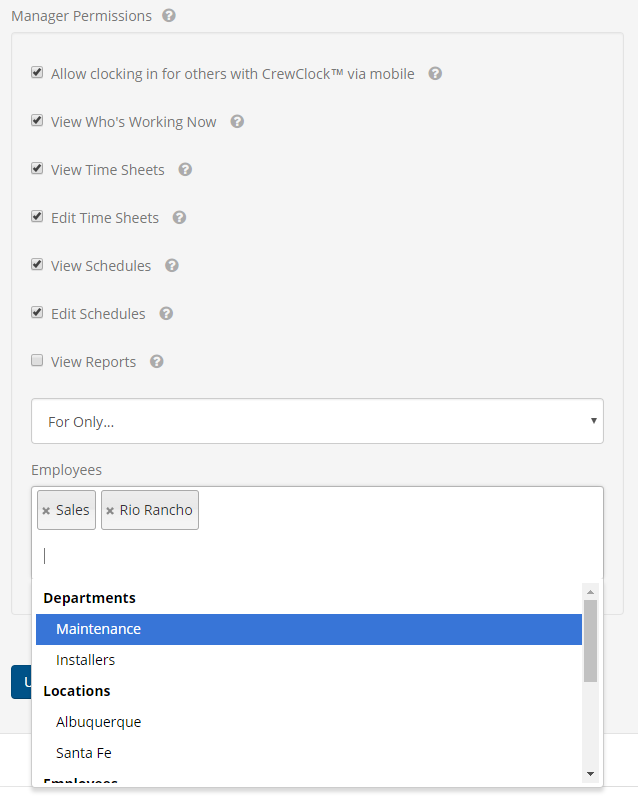 Just assign the employees that a manager, supervisor or foreman is responsible for to a Department or Location and you can set their manager permissions to only be available for the selected employees. When assigning Manager Permissions to an employee, Departments and Locations can be added in the Employees field to apply the manager settings to all employees in those groups.